Small business owners have enough to worry about. 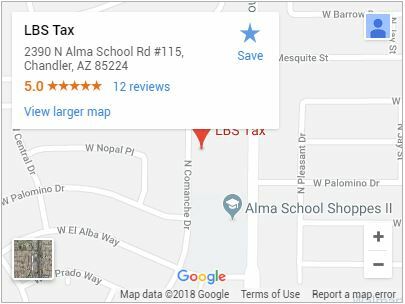 Bookkeeping in Chandler shouldn’t be another responsibility on top of the overhead, employees, production, profit, and other priorities. Meanwhile businesses need some way to keep a close eye on expenses, cash flow, and profit–especially when tax seasons comes around. And when tax deadlines loom, bookkeeping mistakes that were made repeatedly throughout the year can prove to be the most costly. The biggest mistakes made from bookkeeping all stem from trying to keeping records independent of a bookkeeper. What records need to be kept? What documents should be saved? And how do I compile a P&L analysis? Small business owners who think they can keep track of all transactions, while assessing data, may be in over their heads if they lack experience or training. That’s where professional bookkeepers at LBS Tax come in. Professional bookkeepers do the hard part of maintaining, processing, and analyzing daily transaction records so you don’t have to. And while the cost-benefit of hiring bookkeepers might be hard to calculate, the savings of time, money, and stress will no doubt be the best return. Without a professional bookkeeper, here are some mistakes business owners typically make when attempting to do their own record keeping. Maintaining a close eye on accounts receivable is a challenge for business owners who have customers that pay for a service or have yet to pay. Our qualified accounting firm keeps track of your client transactions so you don’t have to. Plus, our detailed system of notation keeps track of what customers are buying, when the transactions occur, and other important details that can influence sales and marketing. Bad record keeping stems from not staying on top of receipts. The costs of small expenses can add up over the course of a year, and not keeping a close watch on those expenses can lead to inaccurate records. Keeping good documentation of expenses will help when tax season comes around, or when your being audited. When the end of the year draws near, tax season begins on the heels of holidays. The timing of these events might seem harsh, but filing taxes can be a little less painful with reliable bookkeeping in place. As you’re getting ready to bite the bullet and get your taxes in order, you may come across some mistakes that you’ve made in the past with bookkeeping. Missing transactions and sales tax: As tax documents are mailed to your home at the beginning of each year, you may have the best intentions. It’s common to put them in a place that you think will be ultra-secure, but then you forget where you’re secret hiding place is when you need them. Rest assured that you will find them eventually, even if it takes longer than you anticipated. If April 15th is approaching and you still haven’t located them, however, take a deep breath and file an extension. Not understanding the numbers Oh dear. Not having good grasp on your year’s P&L (profits and losses) or other numbers, can and will jeopardize your business’s financial future for obvious reasons. Professional bookkeepers from LBS are trained to be fluent in these figures, and can explain any confusing numbers or figures, as well as identify any irregularities or problem areas. Not being ready to file in time. Some people just don’t get their bookkeeping records together to meet the tax deadline. Although the tax filing deadline is always mid-April, many people don’t take proactive steps to keep records and therefore have to push their tax deadlines to the last possible day. If mid-April approaches and you find yourself unprepared, file an extension before the end of the day so you can buy yourself a little more time. Hiring a bookkeeper to set up a filing system, keep track of expenses, draft weekly, monthly, and quarterly reports, and plan time to prepare your return early can really help you avoid some of the common bookkeeping mistakes Americans make. LBS Tax specializes not only in bookkeeping and tax preparation, but also IRS payment plans, collection appeals, and other avenues. With a professional bookkeeper on your side, you can breath easy knowing that your small business and expenses are accounted for, so you can focus on what matters most: production and profit.